Best Chinese Knives: Brother Knives 1601 (Manix 2 XL Style) from Gearbest Review - Budget tactical user knife! Brother Knives 1601 (Manix 2 XL Style) from Gearbest Review - Budget tactical user knife! I received this one a couple of day ago, and I would like to share my thoughts about it. I have to admit that first impressions out-of-the-box weren't great - the knife was dry inside (no lube) and stiff. It also had a little blade-play. Also, I didn't quite like the looks of it in person, it was too big, fit and finish weren't great. I disassembled it, polished the washers, lubed and tweaked the pivot, and the mechanics improved by a mile! Then I tried to use the knife and really understood it's purpose. 1. Ergonomics - very broad handle and excellent Manix 2 XL forms and gimping placement + pretty good grippy G10 (for a Chinese knife). 2. Very good sharpness out of the box and blade geometry. 3. Awesome lockup and mechanics. 4. Usability - I must admit, I sometimes baby my knives, especially the more premium ones. I mean I use all of them, but if I have some tough task - I will not take an expensive knife with ti handle (if I have a choice). But with this knife - I am really willing to truly hard use it and not feel any remorse, a lot more than my Ganzo folders. This is a very important quality for a knife, especially for a tactical one. 1. The opening hole had some sharp edges, that I smoothed using a sharpening rod. 2. The liners aren't skeletonized (could have saved a lot of weight). 3. Fit and finish aren't perfect. 4. Pocket clip placement isn't optimal. Overall I'm very pleased with the knife, especially after I worked on it for a while and made those little improvements. 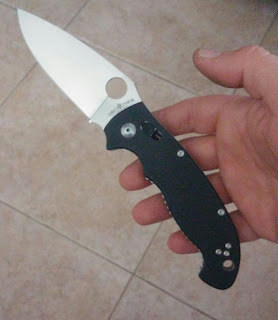 I recommend it, especially for people who really use their knives and people who would like to try the awesome design of the Spyderco Manix 2 XL.